3 p.m. — A roundup of fires in the Yukon Flats area that have updated information from Friday. 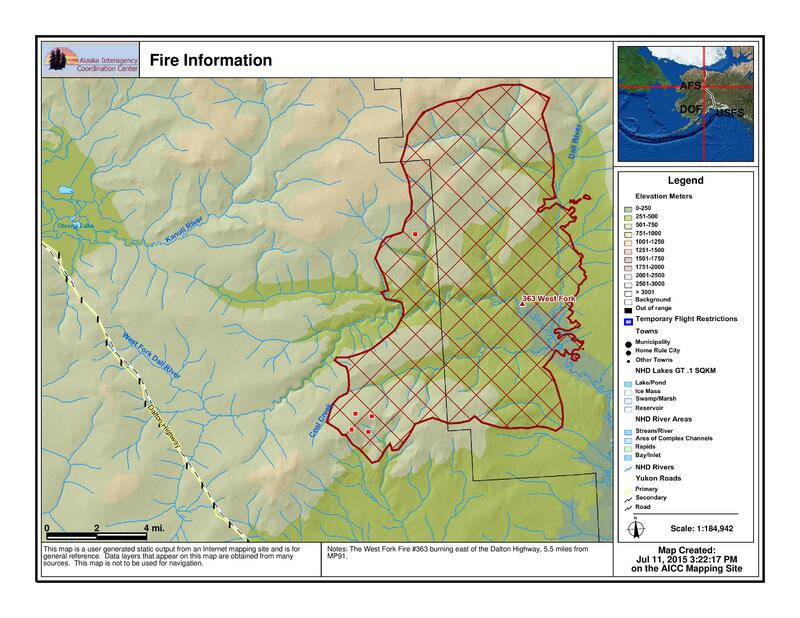 07/10 Friday: The fire is approximately 5.5 miles east of the Dalton Highway near MP 91. Road updates are available on 511.alaska.gov. Fire activity was minimal with creeping and backing reported. Recent rains have helped keep fire spread to a minimum. Fire spread is expected on the west and SW portions of the perimeter. Increase in acreage reflects more accurate mapping. Fire is in monitor status. #704 Salmon Trout: 322.1 acres. Discovered on 7/5 via MODIS satellite. 121 miles northwest of Fort Yukon near the Canadian border. 07/10 Friday: The fire was flown and no smoke was showing. It remains in monitor status. 07/07 Tuesday: An increase in acreage was reported. 07/06 Monday: Reconnaissance reported the fire is 40% active with smoldering, backing, and group torching. Fire is burning in black spruce and tundra. Fire is in monitor status. 07/05 Sunday: Fire is in monitor status. 07/10 Friday: No new update – see #604 Christian River #2. 07/09 Thursday: Reconnaissance reports that this fire has burned together with #604 Christian River #2. Any further updates will now be made under fire #604. 07/07 Tuesday: An increase of 700.9 acres was reported. 07/06 Monday: Reconnaissance reported the fire was 20% active burning in white and black spruce. Fire is in monitor status. 07/10 Friday: The fire was flown and appeared to be 5% active, burning in white spruce. Fire behavior was minimal with creeping and smoldering. Minimal growth is expected. The fire continues to be in monitor status. Fire acreage increased (note, fire now also includes #605 Christian River #3). 07/09 Thursday: Reconnaissance reports that this fire has burned together with #605 Christian River #3. 07/07 Tuesday: An increase of 1,338.5 acers was reported. 07/06 Monday: Reconnaissance reported one interior smoke showing on the north end. Fire is in monitor status. 07/10 Friday: Increase in acreage due to more accurate mapping. Fire remains in monitor status. 07/09 Thursday: Reconnaissance reports that this fire was 30 percent active with smoldering on the west end. Fire remains in monitor status. 07/06 Monday: An increase of 430 acres was reported. 07/05 Sunday: Reconnaissance reported the fire to be 30% active with smoldering. Fire is in monitor status. 07/09 Thursday: Reconnaissance reports that this fire was 60 percent active and smoldering. The fire remains in monitor status. 07/06 Monday: An increase of 135.8 acres was reported. 07/05 Sunday: Reconnaissance reported the fire to be 50% active. The activity was along the entire southern side and east flank. The fire remains in monitor status. 07/08 Wednesday: A decrease of 16,462.3 acres is due to better mapping. 07/06 Monday: Reconnaissance reported two smoldering spots with smoke showing from each. Fire is in monitor status. 07/10 Friday: Increase in acreage due to more accurate mapping. The fire remains in monitor status. 07/09 Thursday: Reconnaissance reported no visible smoke. The fire remains in monitor status. 07/06 Monday: A 3,767.3 decrease in acreage was due to better mapping. 07/05 Sunday: Fire reconnaissance reported a 6% active perimeter with smoldering, creeping, backing, and group torching. Fire is in monitor status. 07/10 Friday: Increased acreage due to more accurate mapping. Fire remains in monitor status. 07/09 Thursday: Reconnaissance reported the fire was creeping with minimal activity. There is potential for the fire to spread on all sides. The fire remains in monitor status. 07/10 Friday: Decrease in acreage due to more accurate mapping. Fire remains in monitor status. 07/09 Thursday: Reconnaissance reported the fire was not active and no smoke visible. The fire remains in monitor status. 07/05 Sunday: Reconnaissance reported the fire was 5% active with smoldering and creeping. There were three smokes showing. Fire is in monitor status. 07/10 Friday: Fire activity was reported as minimal with creeping and backing. Potential fire spread exists on all sides of the fire with most movement expected on the west and north sides. Increase in acreage is due to more accurate mapping. The fire remains in monitor status. 07/09 Thursday: Reconnaissance reported a one percent active perimeter. The fire remains in monitor status. 07/05 Sunday: Reconnaissance reported a 40% active perimeter with smoldering. Smoke hindered ability to map. It appeared to be most active on the south edge. Fire is in monitor status.